September 10, 2018 was an important date for those seeking to provide scientific evidence for homeopathy. The journal "Scientific Reports" has published a paper , which states that a homeopathic remedy based on very high dilutions of the plant Rhus toxicondendron (poison ivy) is at least as effective as a drug (gabapentin) in reducing pain and its molecular correlates, both in experiments on cells and on an animal model (the rat). A study describing the efficacy of homeopathy in an animal model (in which we expect the placebo effect to be absent) is contradictory to everything we know. For it to be true, a radical change in the way physics, chemistry and molecular biology describe the world is required (not just in medicine). 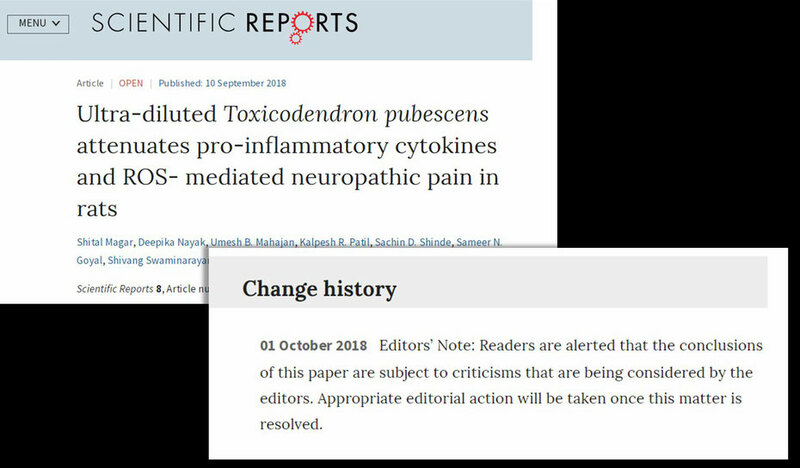 It is true that the study has passed the peer-review process and the newspaper in question only reports its contents; but what matters is the overall scientific consensus, not the single published article , which often turns out to be inaccurate and unrepeatable. Now, the point is that the article published by Scientific Reports contains several inaccuracies. For example, let's consider Figure 1 of the paper (in vitro experiments on cells), reproduced below, and in particular the panels from E to K.
In addition to incorrect labelling of the H panel (which should correspond to a dilution of 1 X 10-12) and the corresponding erroneous reuse of panels G for panel H, you may immediately notice the duplication of panels I and J (red box), which instead correspond to different concentrations .Consider now Figure 3, which shows the results of some experiments on rats. Panels A and B of the figure in question are reproduced below. The two panels should represent different experiments on different rat groups, measuring the time that passes between the application of a painful stimulus to the paw of a rat and the retraction of the paw by the animal. In particular, panel A shows the response after an extreme cold stimulus, while panel B after a stimulus with a very hot object. Well, as you can see, every experimental point in chart A is almost perfectly preserved in graph B (look for the coloured lines joining the experimental points in the two panels); in practice, the two graphs contain numerical data almost all identical, except for a few experimental points. Since these are different experiments, this coincidence is impossible. If we limit ourselves only to the figures of the work, then, 2 out of 3 have problems of various seriousness; moreover, even the numerical reanalysis of the results leads to highlight numerous possible discrepancies - even if this is not discussed here. Added to this are some methodological doubts, such as those highlighted for example by prof. Silvio Garattini. After a quick check, it appears that this address is used in other works published by a different author, namely Pritee V. Karwa. Who then is the real owner of the e-mail address provided? And why does it correspond to at least two different authors which published different scientific papers? Ultimately, this work proves only one thing: that even qualified magazines, from time to time, are permeable to bad science. And that is why no one can take for real and proved something as extraordinary as the functioning of homeopathy beyond the placebo effect, before having considered in detail the data presented and the full set of available papers, asking for the help of experts or based on the numerous and rigorous meta-analyses available; especially if those who publicize the results contained in a given scientific paper, have ethical responsibilities towards their readers and the citizens who may pay scientists and experiments with taxes. This is a responsibility that cannot be neglected for the sake of creating or artificially stimulating a debate with the "false balance" technique. Magar, S. et al. Ultra-diluted Toxicodendron pubescens attenuates pro-inflammatory cytokines and ROS- mediated neuropathic pain in rats. Sci. Rep. 8, 13562 (2018). MCT "Suppose Science changes its mind", La Repubblica, 25 September 2018, p. 54. 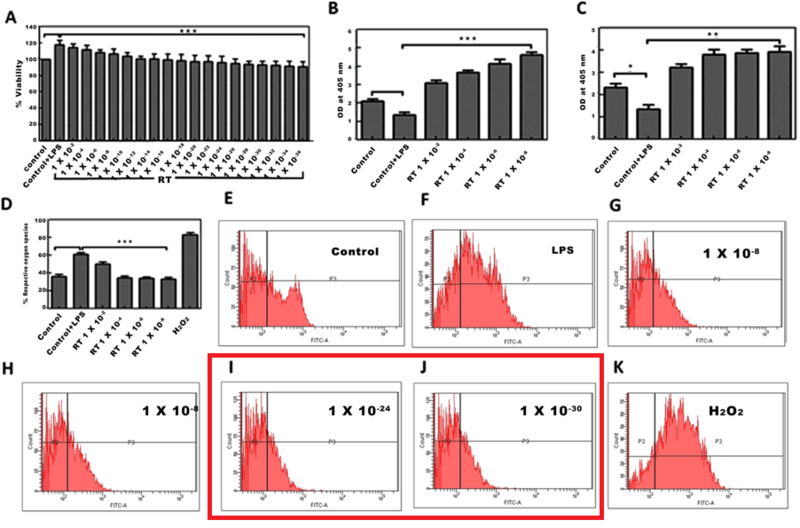 For non-experts, it is worth remembering that these panels represent the results of a type of experiment that the authors make to "count" cells that release certain pro-inflammatory substances after they have been exposed to an irritating compound (LPS, panel F) or oxidizing agent (hydrogen peroxide/panel K). The more the "red mountain" is positioned on the right in the graphs reproduced in each panel, the more the cells have been "activated" by the inflammatory compound. The panels G, H, I and J represent (according to the authors) the results after the cells have been treated not only with the irritating product, but also with the homeopathic preparation at increasing dilutions; we can see that in the presence of the homeopathic product, the "red mountains" remain on the left, instead of moving to the right, despite the presence of the irritating product. The authors then deduce that the ultra-diluted product blocks the action of known oxidants and irritants (in vitro). Really? Let's take a good look: first of all, panel H is labelled with the same concentration observed in G and is a full duplication of it. Probably an error; but there are worst things. Panel I results in fact the exact copy of panel J, although the two panels refer to different experiments. It is a classic example of duplication, which immediately leads every serious researcher to doubt the reality of what he/she is seeing (and to ask for the original data). Duplication cases include anything from honest errors - due to mishaps of sloppiness in preparing the work - up to real fraud cases (in which the authors duplicate the images voluntarily to cover the fact that they did not perform some experiments); in this case, an accurate investigation is needed to establish what is the case. It seems that the journal is reacting to criticism.